This article Created: "May 9 2014"
This is My "Re-Design" of another Persons Design. "CLICK HERE", to see his Origional Design. But there is "No Contact info" on his site. But my thought was to Improve it even More. 1) First, I decided to use a 9 Volt Battery. Idle Current of the Entire Circuit is 16 mA., with No Sounds being Detected. This Current does increase UP-TO 21 mA. when Really Loud Ultrasonic Sounds are Detected. So a 9 Volt battery should give pretty good life. 2) I also decided to not use the 10Khz Filter using a coil. I found that just a .01 cap across the volume control, Reduced the Unwanted Frequency to a Very Low Level. 3) I also changed his 33K resistors to 10M ones that are more suitable for the 4066 IC. This resulted in a slight Increase in Sensitivity. 4) I replaced his Output Power Amp with an LM386. I Also put provisions for a Gain of 50, instead of the Basic gain of 20. Although the Gain of 20 is probably best for most needs. 5) I changed the Input Transistors to a 2N5088 for a Higher input Impedance and More Gain. The Microphone I used here is a typical "40 Khz" Transducer. 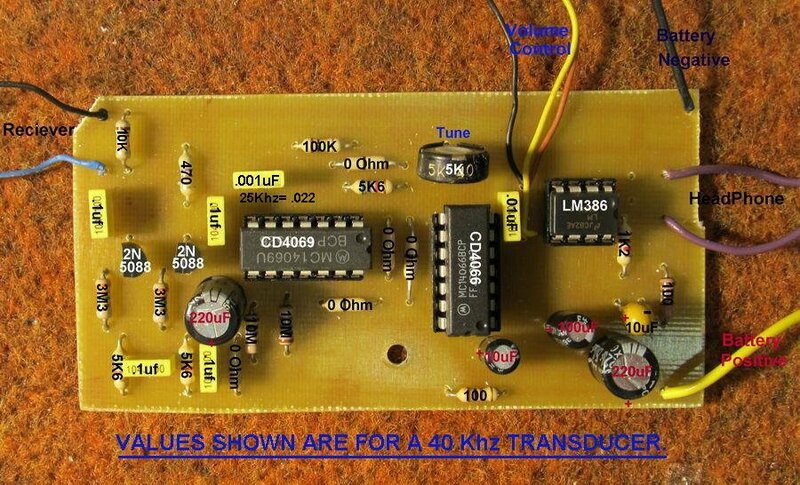 These "40 Khz" Transducers are available from many sources or if Wanted you can use a "24 Khz" Transducer. This is Easily Done by having someone "Rub their Thumb and Fore-Finger Together". This produces a Nice Sound to detect. Now Point the Transducer at their fingers and Adjust the Tuning Control for the Loudest Sound at the Greatest Distance. Once this is set correctly, it should Not need any further adjustment. You should be able to hear this sound at a Distance of More than 2 METERS. NOTE: This Detector will NOT pick up Human Voices or Most Back Ground Noises. 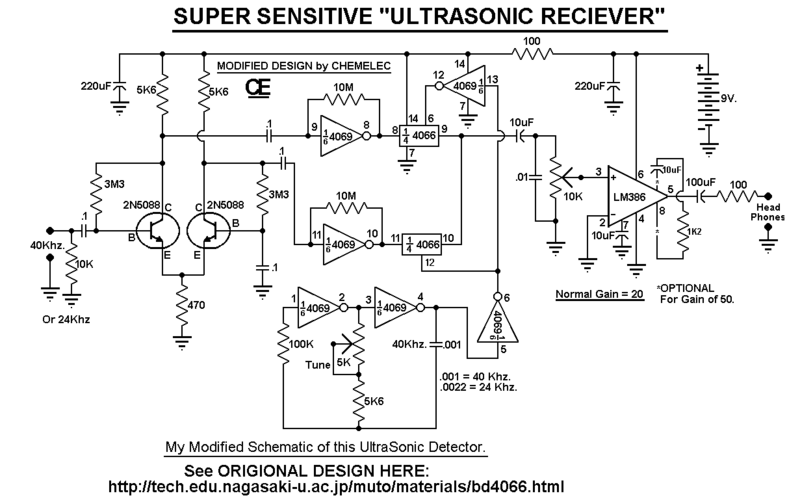 conjunction with the 40Khz or 24Khz Transducer. and also a Greater Amplified Signal over a greater Distance. 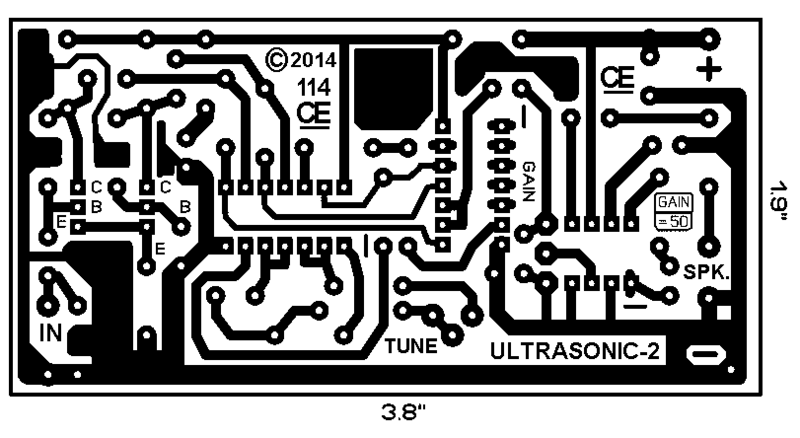 NOTE: The PCB or a Kit of Most of the Parts & PCB is Available from me. 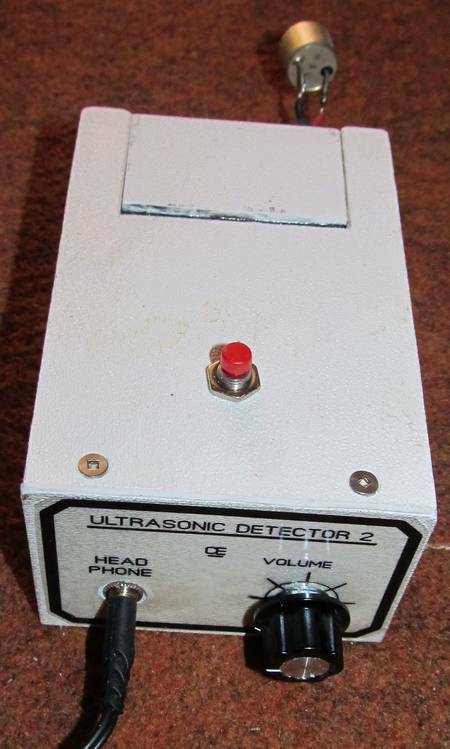 Click here for my Video of this Detector. Click here for My Schematic"
Click  Here for My PCB. My Completed Project in my custom made box. Note: I just used a "Momentary" Push Button, for the ON Switch. PUSH and HOLD to hear sounds, This Saves on Battery Life. Some Imformation in this Article is "Copyright protected".